How do you survive in Subnautica? There is no easy answer to that given that we are talking about an underwater survival game that refuses to hold your hand. 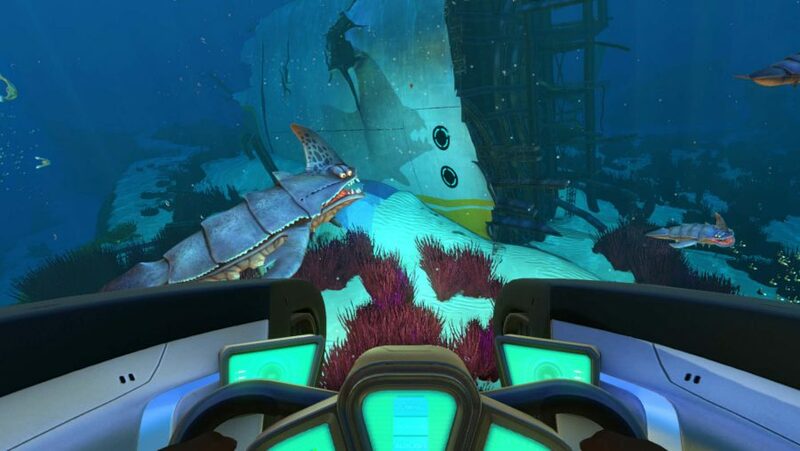 Once you climb out of the Lifepod 5 and take in the wreckage of your mother ship – now a blazing wreck in a vast alien ocean – a few hints will introduce you to your tools, but that is the only help Subnautica will offer you. 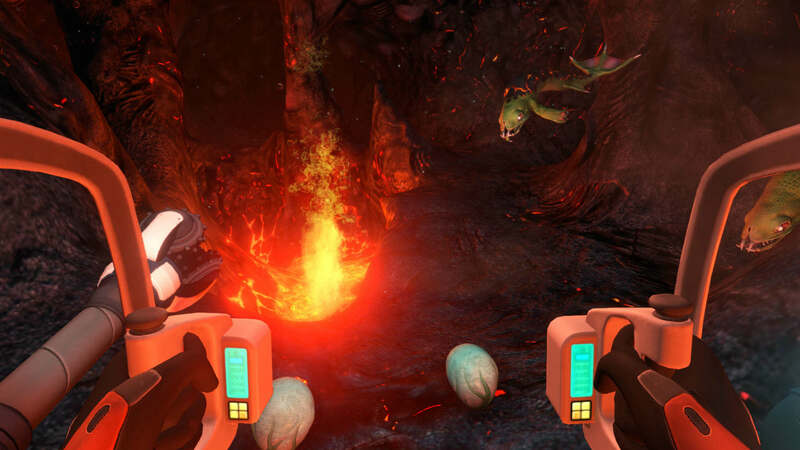 With food, drink, and oxygen levels that need managing, as well as an ocean full of marine beasties ready to rip you to shreds, it’s easy to feel out of your depth in Subnautica. There are no missions or objectives to hold your hand, either – it’s just you and you alone against this watery world. However, don’t fear (unless you have aquaphobia, in which case Subnautica might not be the game for you), we have some tips to help you on your way. After hours of scavenging resources and doggy paddling as fast we can from scary predators, we have created an introductory set of top Subnautica tips that will be sure to turn you from shallow swimmer to a veritable Poseidon in a jiffy. Probably. 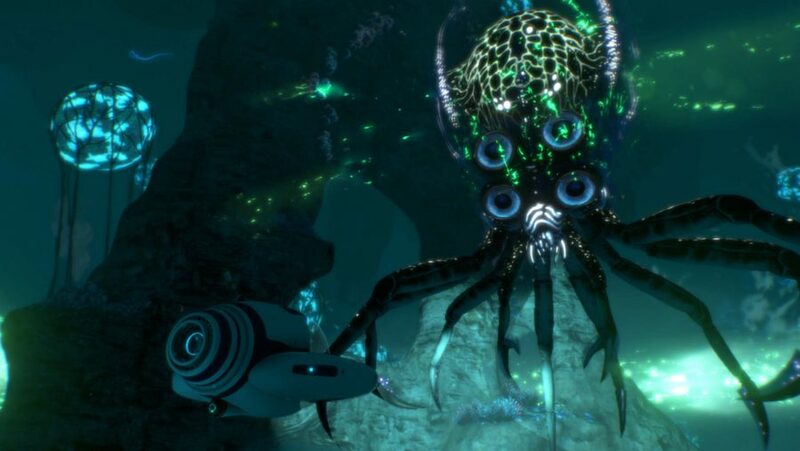 Without further ado, welcome to our Subnautica guide. Subnautica is a survival game with Minecraft, Terraria, and Don’t Starve being key inspirations. That means, first and foremost, you are going to need to survive by making sure you have sufficient food, drink, and oxygen. You will start by rising from a lifepod that is on fire. We’ve had better starts. Use your fire extinguisher to put out the blaze and then get to grips with your – albeit mostly broken – facilities. Pinch a med kit from the Medical Kit Fabricator (it gives you a new one every 30 minutes) and use your ladder to get yourself out of the pod. Once you have marvelled at the scale of the wreckage from your mother ship, the Aurora, savour that first dive into Safe Shallows. Remember: you can always see where and how far away your lifepod is away from you. 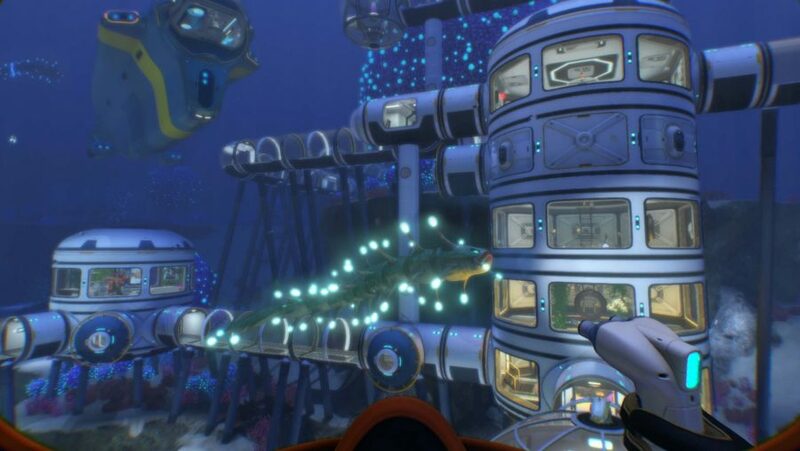 As with many survival games, there’s an element of trial and error with Subnautica. Pick everything up, chase down every fish that does not fancy chasing you back, and bring all the resources you can back to your lifepod to see what you can craft in your Fabricator. Crafting the right tools will help you explore further so that the world of Subnautica becomes your oyster. Just make sure you come up for air every now and again. As Safe Shallows is the place your lifepod crash lands it will be the first biome you come across. Located near the centre of the map, close to the Aurora, you will not have much to fear. The clue is in the name: not much represents a threat to you here. A relatively low maximum depth of 80 metres means there are few environmental hazards and predators knocking about in Safe Shallows. On the other hand, keep your goggles peeled for a wandering Gasopod or hostile Crashfish. Despite Kelp Forest being one of the first biomes you will happen upon in the Subnautica map, it is also one of the most diverse. You can descend to the murky depths of 160 metres this time but Stalkers prowl amidst the towering creepvines. If you able to safely navigate past them – as well as the Bleeders and Drooping Stingers – there are plenty of piles of scrap metal lying on the seabed. Grassy Plateaus is distinctive due to its large, pillar-like structures covered in blood grass. This is a vast area that many diverse life forms call home, but of them all, make sure you keep an eye out for Biters: red tadpole-sized fish with sharp teeth and a hungry belly. Also stay clear of mysterious sand clouds as they are likely caused by dangerous Sand Sharks. 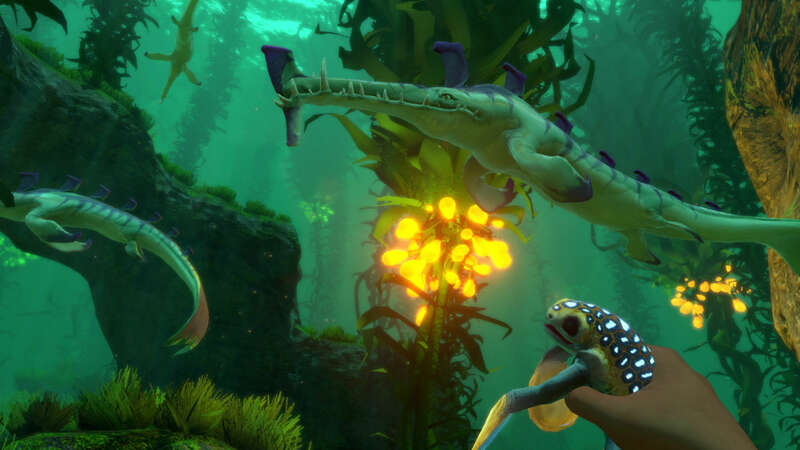 Subnautica creatures come in all shapes and sizes – from the tiny, passive Rockgrub, found lighting up the caves it calls home, to the massive Sea Dragon Leviathan. Stay well away from the latter, obviously. Thankfully, there is little in the way of aggressive fauna at the outset, but these red, horned blighters can be found in Safe Shallows and its caves. They live in a symbiotic relationship with the Sulfur Plant with it opening to reveal the Crashfish inside. If this happens, get ready to dodge the imminent explosion. Stalkers are most commonly found in Kelp Forest, but they also are known to chase Peepers into the Safe Shallows, so wary of their bite. They have a fondness for metal, so, if you can evade them, their dwellings are a good place to hoover up this precious material. That also means you can drop metal to get a Stalker off your tail. You will come across many dangers in your time submerged in this alien sea, but this world can be a relaxing place, too. This defensive herbivore might not strike the first blow, but it will fight back by releasing green, acidic gas pods from its tail if threatened. Luckily they are relatively slow. If you are inside the noxious cloud you will start to rapidly taking damage with an increased decline in nutrition. However, your lost health will regenerate once you are at a safe distance. Or, if you have crafted the Stasis Rifle, use it to stun the Gasopod. Despite the name, if you start swimming after this fish, it is not going to come back. That said, they are easy to catch and plentiful during daylight hours. Stockpile them to build a steady supply of food and drink. Keep an eye out for the distinctive Bladderfish. Their purple outer membrane functions as a natural water filter and, when caught, can be turned into Filtered Water. These fish are slow and easy to catch, so if you gather enough of them, you will never find yourself parched again. To survive in Subnautica, you need to carefully balance three things: hunger, thirst, and oxygen. In the beginning, you will likely be getting to grips with finding the materials to satiate these primary needs. 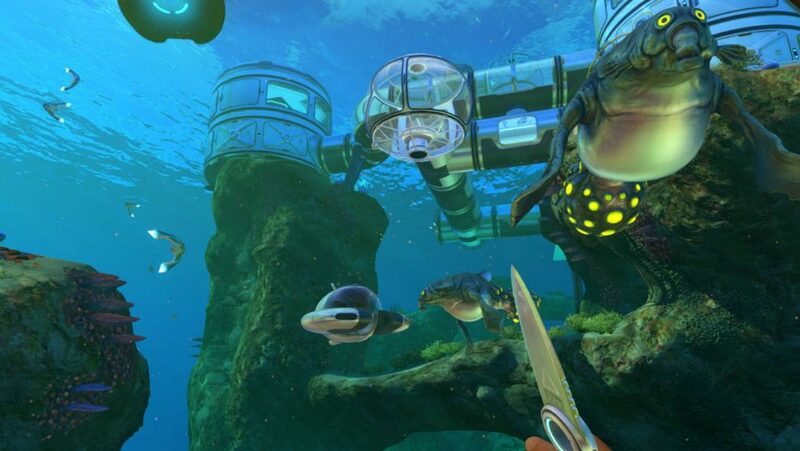 Then you will need the tools to dive deeper and explore more of the Subnautica map, which first need to be crafted. In the lifepod a machine called a Fabricator can be found, and fortuitously it is still operational despite the fire that has ravaged the rest of the place. The Fabricator is the appliance with which you can turn your oceanic plunder into food, drink, and other key items. Be on the lookout for Subnautica blueprints throughout the world, too, as they are necessary for crafting more advanced items. Fish – can be turned into food and drink. Do not eat too much, though, as this will hurt you. A lesson for life, really. Quartz – found on the sea floor in white grey clusters. Use to make glass. Salt deposits – found on the seabed, often near acid mushrooms in white cube-shaped crystals. Necessary for crafting cured food and water. Acid mushrooms – found on the sea floor and hazardous if hacked at with a knife. Use to make batteries. Metal salvage – typically gathered by Stalkers on the seabed. Craft titanium with this, which is useful for crafting the items below. Oxygen Tank – boosts your oxygen levels by 30, which allows you to dive deeper and for longer. Survival Knife – allows you to cut away items such as otherwise unattainable flora for crafting. It’s also handy for self defense. Scanner: – gives you information about the life on the planet and can be used to find more blueprints. Fins – allows you to swim faster. Repair tool – does exactly what it says on the fin: it repairs things. Repair your lifepod to travel anywhere in Safe Shallows. These Subnautica items should be enough to get you started: they will allow you to explore more of the underwater world, and do it more efficiently, too. Keep an eye out for new, interesting items and blueprints to see what your Fabricator can churn out. Yeah, here’s the thing about the Subnautica map: you don’t get one. The world can be rather tough to navigate without an idea of where you have and haven’t been, so this mod by newman55 handily adds one to your PDA under the Beacon Manager tab. The more tools and items to which you can easily access is crucial to having a successful time in this subterranean setting. This mod from RandyKnapp lets you add up to 12 quick slots with hotkeys for each. That’s up from a measly five. For most Subnautica mods, you’re going to need qwiso’s mod loading framework. Note: if there has been a game update, you’ll need to reinstall this and your other additions should work as normal. Will Subnautica get multiplayer? The game can be a lonely place at the best of times, so it would be great if it did. 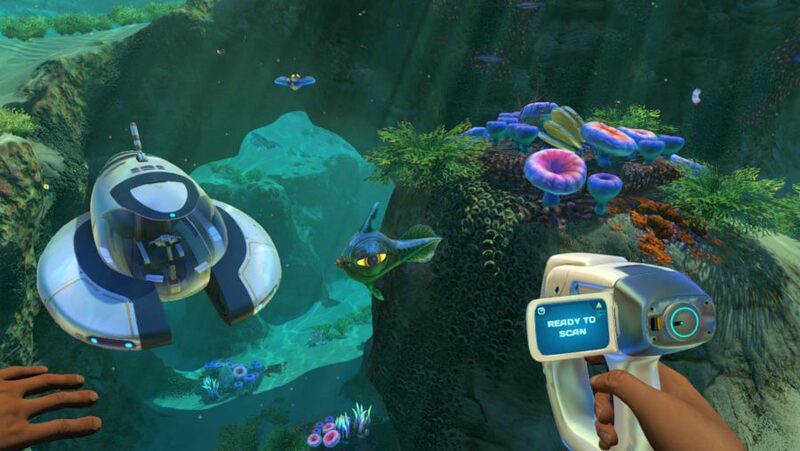 But if you are looking for a Subnautica multiplayer mode then it seems you might be waiting a while. “Subnautica has no multiplayer, we’re not planning on adding it. We’ve done some experiments and our current estimate is it would take us years to add multiplayer, because every part of the code would have to be changed,” game director Charlie Cleveland tells us in an interview. However, a Subnautica multiplayer component does have an outside chance of being added down the line. “We are actually going to investigate it a little more after 1.0 to either put it to rest once and for all, or add it,” Cleveland tells us. If you are hoping those deep, dank underwater caverns will be less frightening with a friend, there is still hope.